It's Wednesday once again and this is my first ABC Wednesdays post for the year. 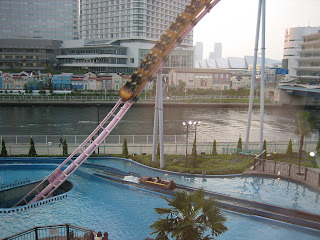 Today's letter is Y for Yokohama... the city where I live is one of Japan's oldest port cities. 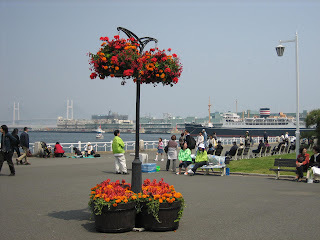 It is celebrating the 150th Anniversary of the Opening of the Port of Yokohama this year! Allow me to give you a quick tour around this charming big city. 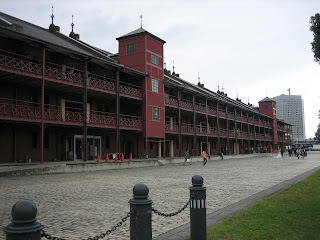 The Yokohama Red Brick Warehouse, one of the oldest buildings here that is made of thousands of red bricks! The inside of the warehouse has been converted into a cultural hall, shopping boutiques, restaurants and novelty shops. 1. 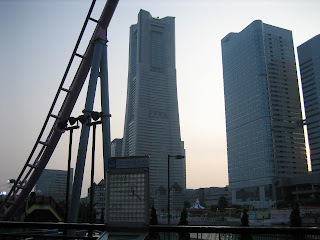 The imposing Landmark Tower, Yokohama's famous landmark. 2. Wanna go for a roller coaster ride? It goes down under a dark passage. Eerie and exciting! 3. 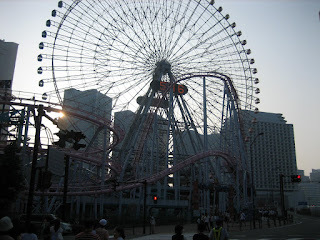 The Giant Ferris Wheel and Cosmo Clock at Cosmo World in Minato Mirai. 4. A View of the bay and beyond in Minato Mirai. Can you see the Marine Tower ahead? This photo was taken last year when I was only a few weeks pregnant. 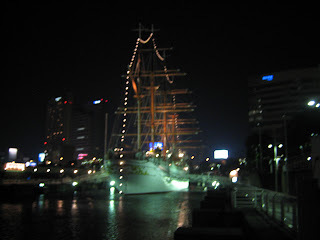 L: The Nippon-Maru (the Sail Training Ship) at night in Minato Mirai. 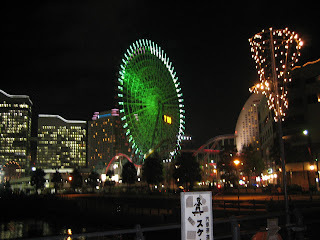 R: A night view of Minato Mirai area. 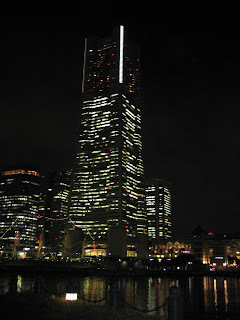 The Yokohama Landmark Tower at night. 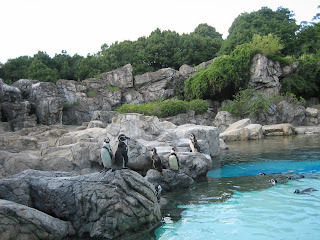 The penguins in Zoorasia (Yokohama Zoological Gardens) - a zoological park dedicated to the display and preservation of endangered species. ABC Wednesday posts can be found here and here. Thanks for the virtual visit! It was a great Y. A marvellous tour!Thanks for sharing! Some great photos, and an excellent tour. Many thanks - for this, and your kind words on my blog. That was a great walk through Yokohama! It looks like a beautiful, modern and very clean town to me! Thank you for sharing this. Thank you also for the visit to my blog. @ Reader Wil: yes indeed, it is a modern and clean city! @ Gmirage: yup, hope you can visit soon! 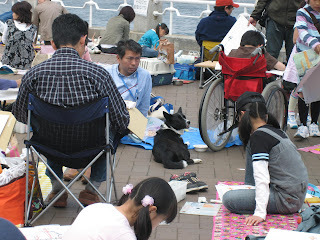 am sure you will enjoy touring around Yokohama and Tokyo’s different districts. Great coverage of a great city. And the perfect ‘Y’. Thanks for the tour of your interesting city. I love how these theme posts let us see so many parts of the world. Great choice for the letter Y. This city looks like it is full of fun things! I love the ferris wheel and the penguins! Oh no, I am not expecting anything. Kaish found it in the garage and brought it in the living room. He wants a baby to go in it. : ). Me too. My husband is putting up a little resistence though. Wonderful photos from a big city.I really would like to go there some day. 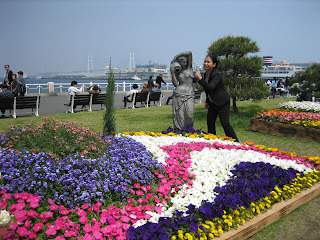 It’s been almost 45 years since I have seen Yokohama and I love this tour of all its current wonders! I would love to visit that zoo. And I wish I could enjoy a ferris wheel ride. Happy Wednesday, and I hope to see your Z next week. Maybe it should be Z for Zoo and you can give us a tour of the endangered species? Beautiful City & of course my dream city to visit someday.I love the photos & Thanks for sharing.Have a nice day. Thanks for the tour around Yokohama! Have a great weekend!